R.L. 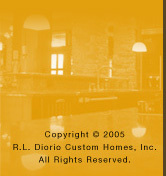 Diorio prides itself on building top quality, innovative designs that meet and exceed its customer's expectations. Our awareness of the market demands, latest technologies, available building sites and quality sub- contractors and suppliers makes us a top choice for someone planning to build a new custom home. Ron Diorio's basic building philosophy is simple. "Try to build the best house you possibly can and you will be successful." Once a customer moves into their new home R.L. Diorio is always on call for any problem that may arise. R.L. Diorio strives for the highest quality attainable in both materials and workmanship in every home we build regardless of price range. We would gladly put our homes against any others at the same price point to show our quality will not be surpassed. A quality home starts with a great design. A quality design is just as important as the use of quality materials in the construction. Also is the case for using high quality craftsmen and sub-contractors to do the work to construct the homes. "The use of quality materials does not guarantee a quality home," says Ron Diorio, President and founder of R.L. Diorio, "Skilled, quality people are needed to put it all together."